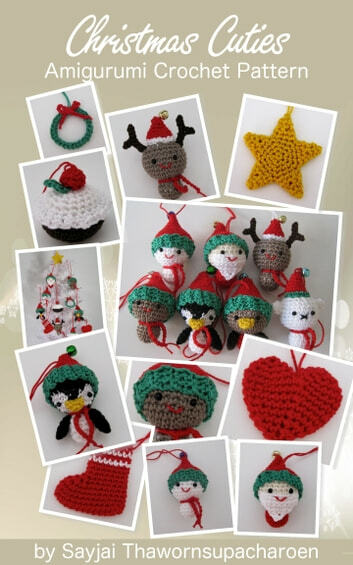 This is a crochet pattern to crochet Christmas dolls and ornaments for your Christmas Tree. A basic knowledge of crochet is required to read the pattern. 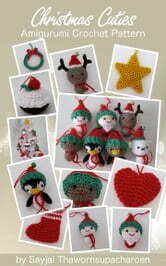 The Christmas dolls and decorations are easy to make. The pattern is written with U.S. crochet terms. You use single crochet stitches (= double crochet stitches in the UK) and double crochet (= treble crochet in the UK). You can use No 2 yarn (Sport, Baby) and a 3.25 mm hook (US: D/3.25, UK: 10). Included are instructions for: a Snowman, Santa Claus, Christmas Cupcake, Deer, Gingerbread man, Penguin, Red Robin, Polar Bear, Christmas Sock, Star, Wreath and Heart. You can make them bigger or smaller than my ornaments, without changing the pattern. The size of the ornaments depend on the size of crochet hook, thickness of yarn and how you stuff them; bigger hook and thicker yarn make bigger dolls, a doll stuffed tightly is bigger than a loose stuffed doll. - This crochet patterns cannot be printed. You read them on your tablet, smart phone, computer or notebook.